She's Fantastic: The Women of WETWORKS! 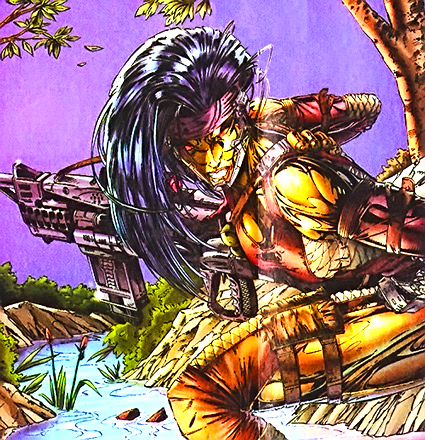 Whilce Portacio's Wetworks was originally intended to be one of the core titles of Image Comics' initial barrage of titles in 1992. It was delayed for 2 years which, for me, made it become the "breath of fresh air" for Image after my interest in the erratically released Spawn, Wildcats, and Youngblood had begun to wane. 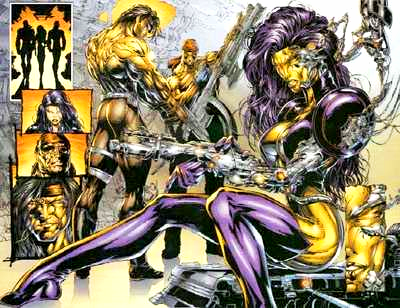 Whilce Portacio gained much fame for his pencils in X-Factor and Uncanny X-Men, but it took Wetworks to make me view him as the 90's powerhouse artist he was. I think the metallic design of the characters really showed off his talents. 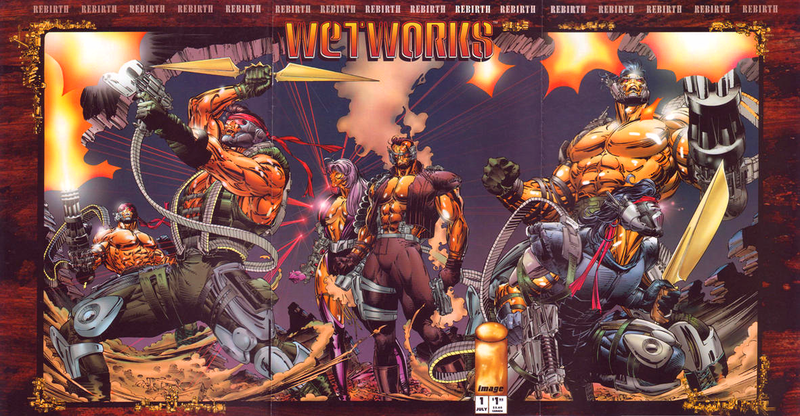 Wetworks is about a Black Ops team who utilize golden metallic symbiotes as full-body protection when warring again supernatural foes (lots of vampires and werewolves). A great storytelling twist is that they were doublecrossed by their parent organization and are now rogue - it's like A-Team meets Underworld meet Silverhawks. 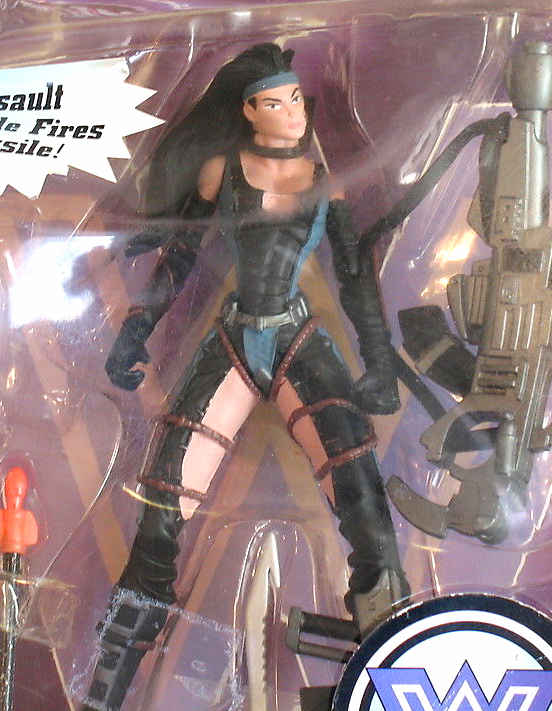 There were several great female characters in the comics and luckily three were made into toys. Let's check them out below! 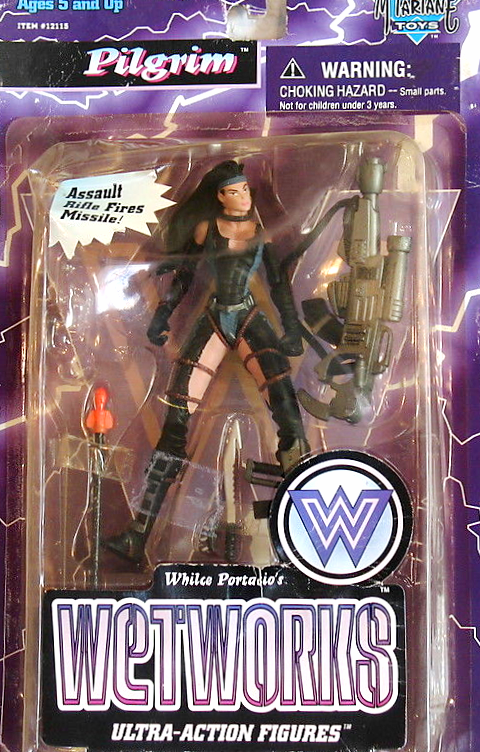 McFarlane produced two series of Wetworks action figures in the mid-90s. This was in the early phases of McFarlane Toys where articulation was limited and everything had an "extreme" edge, but these figures were always a standout for me nonetheless. Cyborg. Effective laser protection system. Rachel L. Rhodes, a Cyborg, has the most secrets of anyone on the Wetworks team. Once a beauty, she now hides within her symbiotic shell. Although she has saved the team from certain death more than once, few of them can bring themselves to trust her or her motives - with the possible exception of Grail. 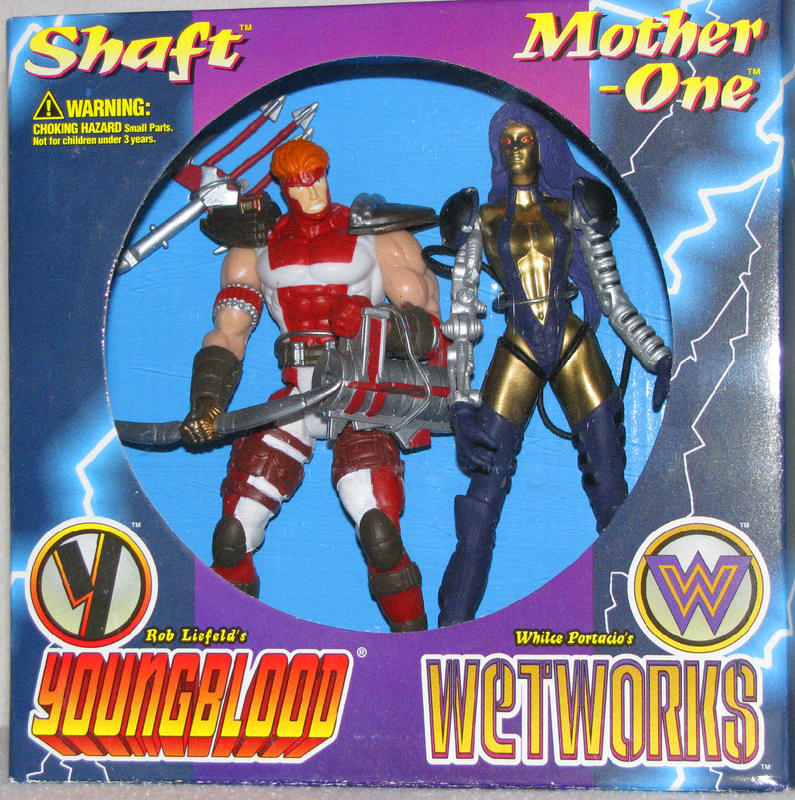 Mother One comes with lots of cybernetic arm replacements. Arguably the military's most deadly sniper, Major Maritza Blackbird has been trained to blend into any surrounding to utilize her lethal talent. Quiet and reserved, she joined the military to lead a life of isolation. Nevertheless, now armored with symbiote body armor as well, she is always willing to put her life on the line for her Wetworks companions and Colonel Dane in particular. Although awkwardly pre-posed, I think Pilgrim is the nicest figure of the group. Pilgrim comes with a large projectile-launching cannon, a "smaller" gun, and a large sword/knife. Note the tonal difference in the gold skin of these figures. They were produced a year apart. It may be accidental or intentional, but I think the newer Pilgrim figure (with her coppery undertones) looks better. A purebred by birth, the Blood Queen is every bit as deadly as she is beautiful. Queen of the Vampire Nation and ruler of House Rhys, she looks to be 30 but is actually over 1,500 years old. A true killer, she keeps her bloodthirst honed by hunting a worthy challenger to her supernatural prowess every 17 years. Blood Queen comes with a large pendant-banner-staff-thing that fits in her hand via a peg. The streamers are made of a pretty stiff rubber. She also has a black thorny-looking sword. 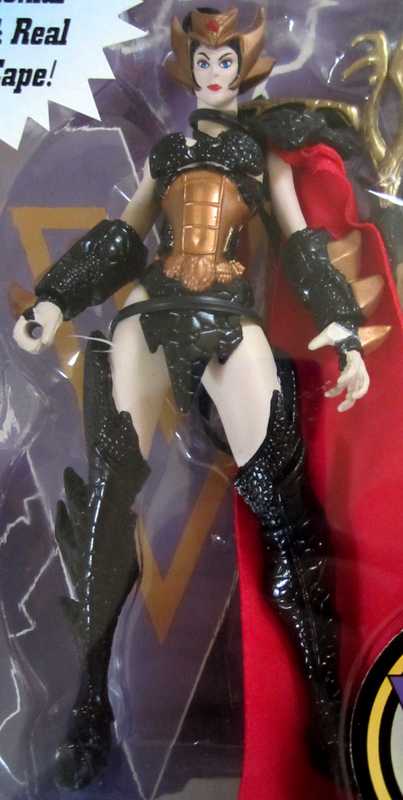 Blood Queen also has a variant wherein all the red parts of her armor are painted black and she has a red cape. They seem to be of equal distribution (at least on ebay). Here are some various images from the Wetworks comics. I'm so glad you reviewed these. 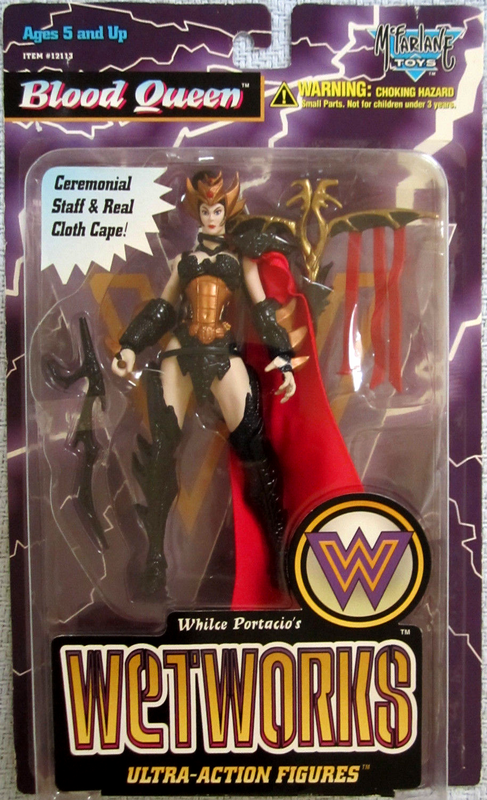 I was a massive Wetworks fan back in those days and I had all of the Mcfarlane figures, minus the repaints. I still have a Blood Queen and two series 2 Grails that are unopened. Which reminds me, I forgot that I wanted to pick up a series 1 Grail on the bay. Man, I just love those two figures! Unfortunately, I can't speak for the rest of the figures. Last time I checked, I remember seeing Mother One arms and various Wetworks accessories in the fodder bin. I know I have a Werewolf and a Vampire laying around somewhere also. Everything else have disappeared. Grail and Grifter were a couple of my favorite Wildstorm characters, and I do hope that DC gets the chance to explore their stories further in the N52. The lackluster effort to include Wildstorm has been disappointingly pathetic. Glad you enjoyed the post! I, too, was a huge Wetworks fan. The female Wetworks figures aren't mindblowing or anything, but they're extremely nostaligic for me so I've been itching to do a review of them. I wish there were some ladies made in the Youngblood line. I would have loved to see Riptide and Vogue. 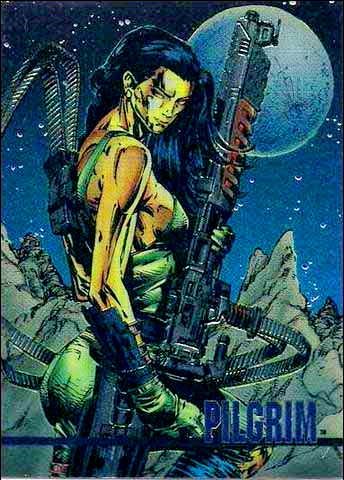 Also I love Diva from Stormwatch. DId you enjoy the Voodoo solo series in the New52? I was a big fan of it surprisingly. It's a shame it ended so early.. there could have been a lot of guest-stars and classic throwback scenarios. Coda warriors, etc. Also, I never read the Ravagers comic, but I was impressed that they squeezed Fairchild into the DC mainstream. Oh man I love that story line! 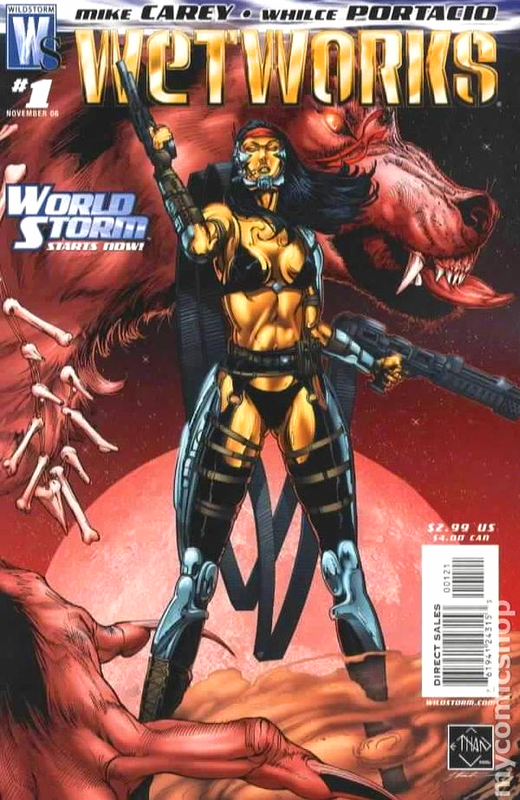 That comic was my first introduction to the vampire vs. werewolf concept, way before underworld or twilight, but I'm pretty sure it wasn't the first. Just my first. I couldn't take Youngblood seriously and WildCATS was off and on (leaning on on though). Stormwatch was pretty stale in the beginning, but when Tom Raney and Warren Ellis was on board, woohoo man that comic freakin' rocked! Out of the WS babes you mentioned, probably Zealot and Vodoo I took a liking to most. I always liked Cybernary, but they hardly ever used her. I did check out your WildCATS review, but I didn't frequent the site as much as I do now. It was a great article man. I never had the chance to watch the cartoon, but I did however work on the Gen 13 cartoon that came out around that time. I know it was horrible, but I mostly worked on backgrounds and IBs. Hey, it was a job lol. Anyways, the Voodoo comic is on queue, so I gotta get back to you on that brother! I have both Mother one and Pilgrim. Don't like the Queen. Still very much like the design, except the cybernetic arm (too 90's). Never read the comic, but this figures might make me dig it out. Yeah the Queen is the least iconic of the group by far. I've been considering re-reading my old books, too... but I'm afraid my memory of them might be better than they actually are. They're in storage at my parents' house - which I'll happen to be travelling to this Thurs night. Maybe I'll dig them out and give it a go.